Singapore: What to do in Katong? Day One of my Singapore holiday involved an early morning start to the day, courtesy of the 5 hour time difference that my body was attempting to adjust to. Personally I thought 6am was a fairly respectable lie-in considering that for my body it was nearly lunchtime, and I just don’t understand John’s muffled grumbling after spying the time on the bedside clock. In the end I started the day with a news update. I know that’s a sad thing to do while you are on holiday, but I’m not a Sky TV subscriber so things like BBC World are relegated to insomnia attacks in the wee small hours, and CNN is something that you only know from movie references and the occasional visit to the parents. After that I was in danger of annoying my time-adjusted husband who was quite happy to have a darn good lie-in, local time. So I did my best wifely thing and took good advantage of the suite. I shuffled through to the living room and read through the Uniquely Singapore Walking Guide to Katong/Joo Chiat. This turned out to be a little gem. It gave a nice background to the local cultures of this area, and to the history of the neighbourhood. It turns out that life here started out on coconut plantations, later becoming a seaside retreat for the wealthy, and finally after World War II it began to take on its more modern form. There are 700-odd “conserved” buildings in this area, including single-storey terrace houses and shophouses. It is a pretty low-rise neighbourhood by my eye. While there are very large condominiums and what look like older HDB estates, they are not completely dominant in this area. There are many homes that would be called either semi-detached or townhouses. In a country where land is at a premium, it makes my eyes water to think of the price tag that many of these homes must fetch. It is promised that if you are willing to take a stroll around the area you will be rewarded by a variety of architectural, cultural and foodie experiences. In the end I settled for an after-breakfast amble around the block that included stopping at a Peranakan store, the Sri Senpaga Vinayagar Temple, and St. Hilda’s Anglican Church. Other suggested stops were admired on my walk, but the sun had become a little less clouded behind the haze by that time, so moving with purpose towards shade and air-conditioning became a priority. 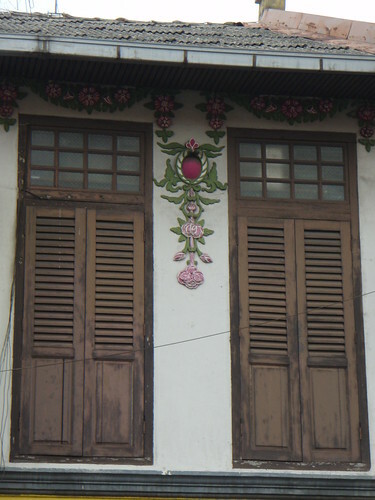 Here’s a bit of information on Shophouses and below is a photograph I took of a detail on the top floor of a house just off East Coast Road. I also stopped by at the Sri Senpaga Vinayagar Temple and got a bit carried away with the elephants. The first photograph of which is a single panel on the huge entry doors. 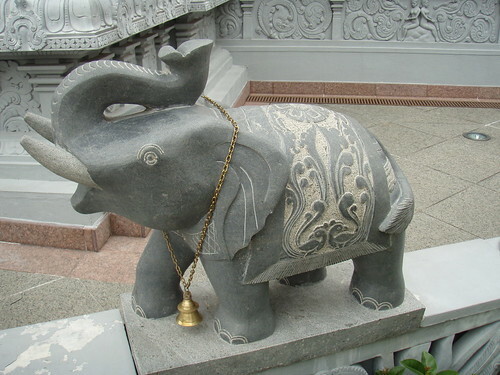 The second is an elephant from the wall in front of the main entrance. I really thought this guy was great. In just about any other society he’d be fair game for taking home as an oversized garden ornament. Might give the Gnomes a bit of a scare though. 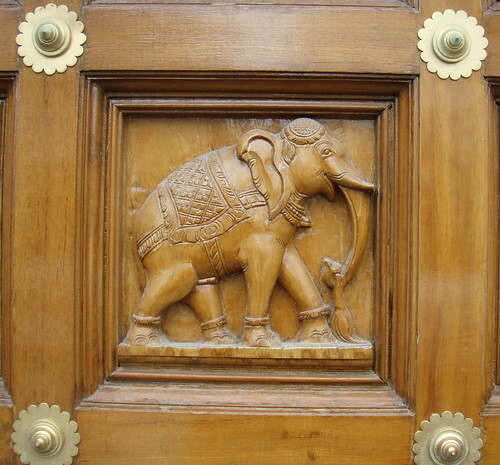 For those who just need to know these things, the connection to elephants is in the name: Sri Senpaga Vinayagar. Lord Vinayagar is the Elephant God alternately known as Ganesha. Well, I’m thinking the choice of an elephant form is pretty appropriate for this particular Hindu deity. I wouldn’t argue with him putting obstacles in my way, and I most definitely crack a smile whenever I get to visit the elephants at the zoo. What about you? After spending some time at the temple I moved on to St Hilda’s, which is a little white church just a bit further up the road. From there I wound my way back to the main road through a series of narrow suburban streets featuring townhouse-style buildings, most of which were separated by a back alley. Cats and children evidently using them as a defacto playground, with left-for-later toys and kittens visible from the street. As I had already stuffed myself on a buffet breakfast, I didn’t stop and partake of the nonya laksa at the local stalls selling breakfast nor did I expand my waistline by sampling the large choice of confectionary on display at the bakeries either. Tempting though some of it was. Instead I finished my walk down Still Road past the former Grand Hotel (scroll to the bottom of the article), looking a little less grand these days and back along Marine Parade Road to the hotel. Hot, damn hot, but a good couple of hours sightseeing on foot. Time for a short dip in the pool. I’ve been to Singapore a few times and love it. The shopping, the food and the culture are magnificent. I appreciate the tips you’ve given on your site, cause I want to go back again soon and enjoy it all over again. Like you, I found the Uniquely Singapore Walking Guide to Katong to be priceless. Thanks for the pics too.